Under fire from all the quarters due to deteriorating law and order incidents in Uttar Pradesh, CM Akshilesh Yadav organized a special “Investors Conclave” in New Delhi, and the results are fascinating to say the least. As per reports coming in from various sources, big corporate have signed MoU (Memorandum of Understanding) to invest Rs 54,000 in the state, during the next 2-3 years. Post independence, this is easily the highest amount of investment which has been promised in one of the most economically backward states of India. Representatives from 20 big companies from 7 countries (including India) attended this special conclave held in the national capital. In fact, this is first such event organized by the UP state government, ever, and the response has been quite phenomenal. – Mukesh Ambani led Reliance Jio has said that they will invest Rs 5000 crore to implement widescale 4G network in the state. This will certainly encourage IT and ITeS industry in the state, as fast internet network is one of the basic necessity. Right now, Uttar Pradesh is India’s 4th biggest state in terms of area and with 20 crore people, India’s most populated state. The state provides the most number of MPs to the parliament, and politically, it is considered the most crucial state. The development and progress which other states in the country such as Maharashtra, Gujarat, Karnataka, Tamil Nadu etc have witnessed is an example which UP government can take forward. In sectors such as food processing, agriculture, infrastructure and industry, and information technology sectors, UP can really achieve great success if the government shakes hand with the corporate world and create a path of overall progress and development. Just to give a comparison, in 2011, when Modi led Gujarat government organized Vibrant Gujarat event in Ahmedabad to lure investments, record Rs 21 lakh crore ($450 billion) worth of MoUs were signed. The current investments promised in UP is only 2.5% of this amount, but yes, it’s a positive first step towards development. 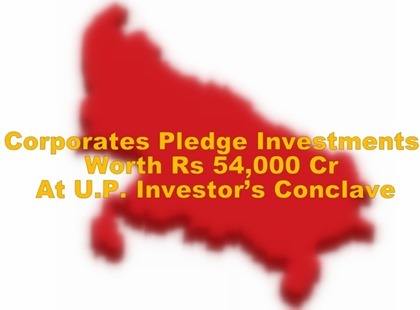 And Uttar Pradesh is one state that requires as much investment as it can get! Top 5 reasons you MUST get Life Insurance!